It sure is nice to be back in the U.S. of A., where leafy greens and steady WiFi connections abound. 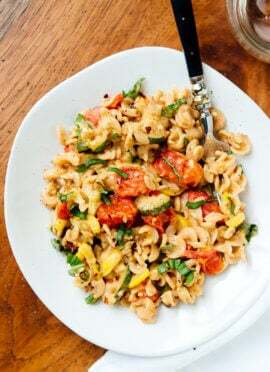 I’m playing catch-up today, so it seems like the perfect time to share this pasta salad recipe that you may have seen last week on Free People’s BLDG 25 blog. 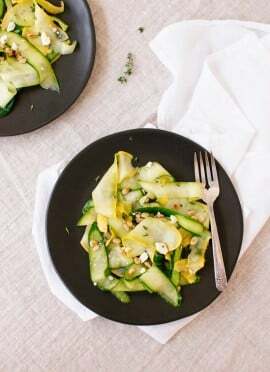 This Mediterranean-style salad is light, refreshing, and overflowing with colorful rounds of thinly sliced raw zucchini and yellow squash. It’s just the kind of meal I’m craving as I recover from a week of overindulgence and adventure in the tropics. By the way, I was in Belize for the launch of a beautiful cookbook about Belizean food called Flavors of Belize. I’m thrilled to be able to reference my favorite recipes now that I’m back home. For a sampling of the recipes in the book, check out the Flavors of Belize recipe page. I have so many photos, stories and meals from Belize that I’m just bursting to share with you. All in due time, promise. You can see a few snaps on Instagram, but for a more thorough synopsis of our trip, check Simone’s summaries on The Trail of Crumbs. Simone is the epitome of rad and I’m so glad I can call her a friend. Hope your weekends are full of laughs and smiles and good food, maybe even this pasta salad. Au revoir! 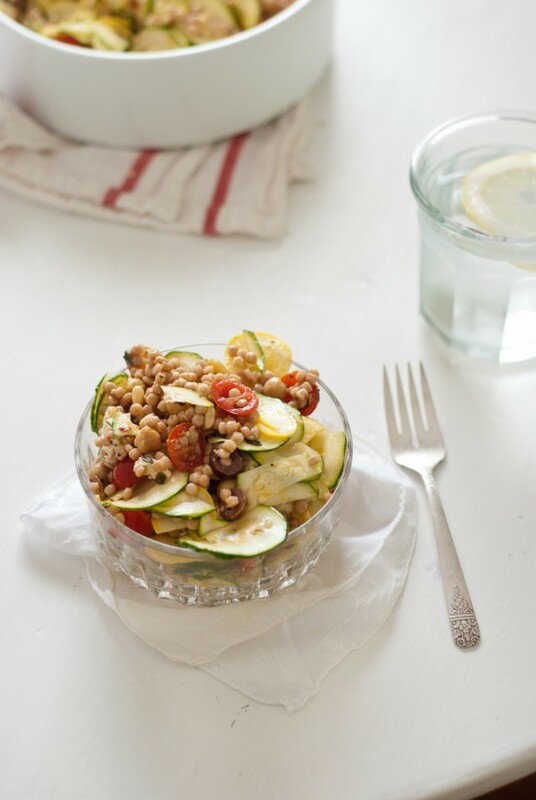 This pasta salad with raw squash and bold Greek flavors is a simple, light summer dish. 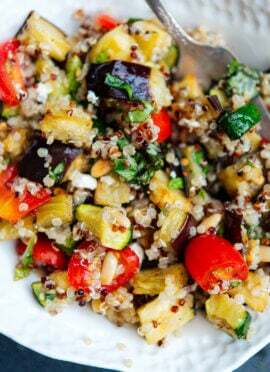 Thanks to the plethora of vegetables, whole grains and beans, it’s a complete meal in itself! Pack up a bowlful for a weekday lunch or serve with a glass of chilled Pinot Grigio for dinner. Bring 1 ⅔ cup salted water to a boil. Stir in the couscous, cover and reduce heat to a simmer. Cook for 18 to 20 minutes, until the couscous is tender and all of the water is absorbed. While the couscous is cooking, whisk together the olive oil, lemon juice, garlic, shallot, sea salt and black pepper in a large bowl. Add the couscous to the bowl and toss to coat with the dressing. Top the pasta with all of the remaining ingredients, and toss to combine. Season with salt and pepper to taste, and add an extra squeeze of lemon juice if necessary. For the best flavor, cover and refrigerate for 30 minutes before serving. Storage suggestions: Store in the fridge, covered, for up to 3 days. Change it up: I used whole wheat Israeli couscous for my salad, but any small whole wheat pasta shape will do. Small shells, fusilli and farfalle are all great options. Just cook the pasta in salted water according to the package’s directions and proceed with the recipe. Make it gluten free: Substitute your favorite small gluten-free pasta for the couscous. Make it vegan: If you choose to make the salad vegan by omitting the cheese, you might want to add a few more sliced olives to make up for the salty punch of feta. Make it nut free: Technically pine nuts are seeds, but you can omit them if they don’t work for you or if you’re concerned about cross-contamination. As for the pasta dish- I’ve just discovered the amazingness of raw zucchini. I can’t wait to try this pasta salad! Glad you’ve discovered raw squash! I love it sliced super thin. Oh, I love this! Just made a quick raw squash salad last night with zuchhini ribbons, tomatoes, red onion, minced basil, and balsamic vinaigrette. It’s the taste of summer in a bowl! Your salad sounds fantastic, Laura! I love zucchini ribbons. So happy you’re back, Kate!! This salad is utterly gorgeous, and exactly what my body is craving these days. This looks so fresh and yummy! I love chickpeas! I’ve never been to Central America but I really want to and your pictures made me want to plan a trip even more! And a lovely lovely recipe to celebrate your return. Pasta salad is the best in the summer! A good trick someone told me once was to put a whole, unpeeled garlic clove in with the pasta or in your case, cous cous as it cooks. Then you take the clove out and mash it through the dressing! It just makes the garlic flavour more warm and subtle. Can’t wait to here more about the trip to Belize! That’s a fantastic tip, Louisa! Thanks for sharing, I’ll try to remember to do that next time. I love garlic! Delicious salad you have here…Can’t wait to try. Love the couscous addition. Gives the salad a unique texture and a little grander. I often crave for salads during the summer. So this is really perfect. Lovely…refreshing for hot days of summer, especially! What a great recipe, perfect for summer! Kathryn, Ooh I’ve always wanted to go to Belize. Cannot wait to see the photos you’ll share with us! We’re in Greece right now eating Greek Salads by the boatload. 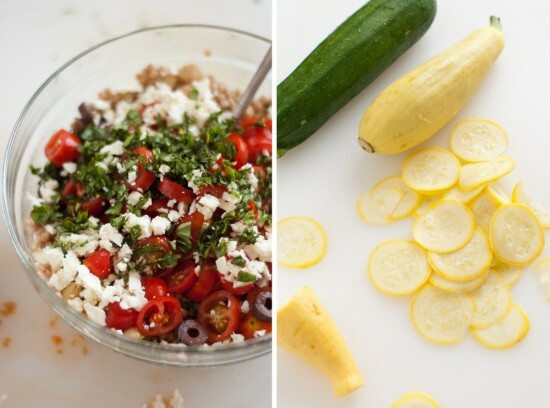 I love that your Mediterranean salad adds even more goodies to the mix. Yum! Ooh, I’m jealous. Mediterranean food is my absolute favorite! Enjoy your time there, can’t wait to see more of your trip on your blog. This summer is lite, healthy and perfect for hot summer day like today! Can’t wait to make this! My kind of salad, light, refreshing and full of flavor. Hope you had a wonderful vacation! Salad looks delic! Where did you get your red and white towels that are seen in the pictures? Love them! Thanks, Allison! The towels are from IKEA, via eBay. Super cheap! Lovely, just lovely! I want to eat this up right now – beautiful photos. I just discovered your blog as it was linked from GrubKit’s blog, and I absolutely love it! 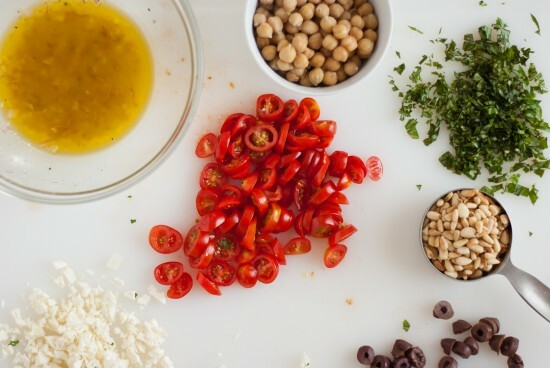 I just moved into my first apartment about a month ago and I am having many new cooking adventures with one of my roommates– I will be trying this salad soon! I was wondering– who makes the fork pictured here? It’s gorgeous! Welcome, Becky! Glad you found my blog. The forks are vintage, I found them in my grandmother’s box of silverware from generations past. All the more special! I made this two nights ago. The verdict: absolutely delicious and so full of colour. It tasted even better on day 2. We’ll definitely be having this one again and again. Thank you! Happy to hear that you enjoyed it, Simone! Made this today….excellent, I added coarsely chopped marinated artichoke hearts…..YUM! Thanks, Lori! I’m glad you enjoyed the salad. It’s one of my favorites. Artichoke hearts sound like a delicious addition! I like your recipes… May i share with friends? I loved this recipe! You’re the queen of dressings. Made this last night and loved it for a refreshing dinner on a hot summer day. I added a finely diced bell pepper and subbed in a cucumber for the zucchini, because that is what the garden had to offer. I love the way the dressing marinated the thinly sliced veggies while we let it settle in the fridge. I look forward to making this one a regular in our house! Thanks Kate! Thanks, Heather! I’m so glad you enjoyed the salad recipe. Your garden fresh version sounds marvelous. Thanks for the great recipe! I made a couple of substitutions, and it turned out great – I used quick barley as the grain and sun-dried tomatoes in place of fresh. The olives, feta and basil really made it pop! Thanks, Annie! Your version sounds delicious! This salad has been a hit with my family since I made it from day one! Hooray! Glad you all enjoy this one. Thanks, Dallas. 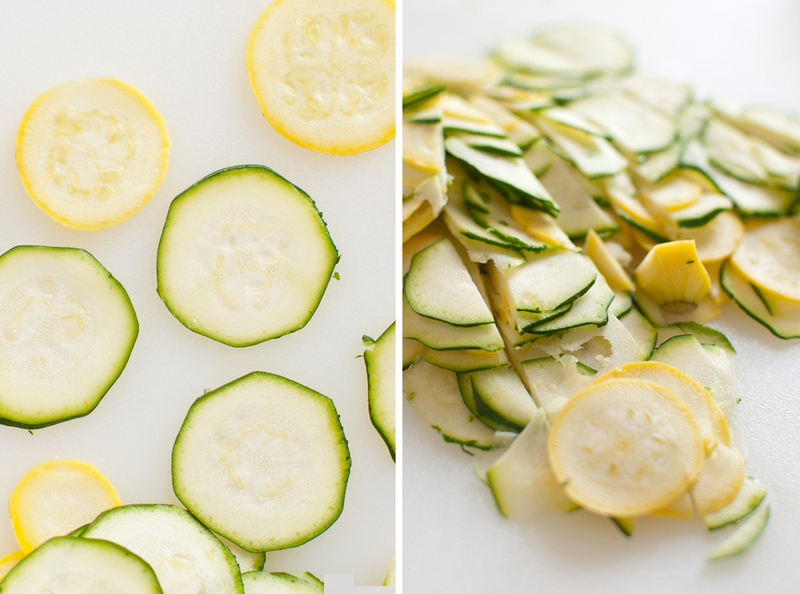 This is a great recipe – but I’m having trouble slicing the squash with a peeler. Could you provide more information on how to do that? Hey Kristen! I’m sorry you’re having trouble. It is a little tricky, depending on the type of peeler you have. I just hooked a bit on the end with the sharp inner blade of the peeler and ran it down to make a skinny round. You could also use a mandoline or just slice it as thin as you can with a sharp knife. I love israeli couscous and can’t wait to try this! One trick I use for the couscous is to toast it first before adding the water to give it a little bit more flavor. Just boil the water in the microwave or in another pot and set aside. Saute the dry couscous in a pot in some olive oil. When it begins to brown add the hot water and cook as indicated in your recipe – be careful when you first add the water as it will sizzle in the hot pan. I don’t like Kalamata olives so I used sliced black and it was fine. I also used tabbouleh instead of pasta or couscous. I loved it! Wished I had made a bigger batch! Your version sounds delicious, Mary. Hi Kate! Do you have any suggestions for squash/zucchini substitutes? Hi Sara! 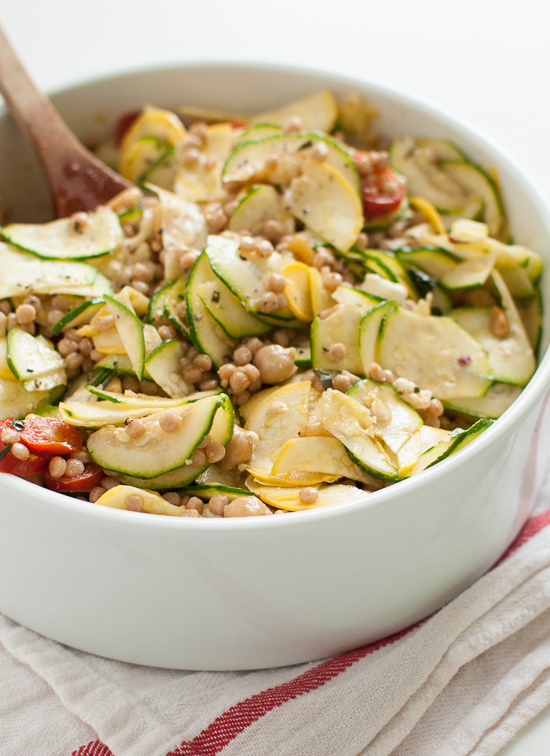 The squash/zucchini is really the backbone of this dish, so I’m not exactly sure. Cucumber might be nice if you’ll be eating the salad soon after making it (it tends to lose water quickly). Shaved raw butternut squash might be fun.